Best At Home Microdermabrasion Machines - The Path to Better Skin? Is Microdermabrasion At Home Effective? What Should I Do Before Microdermabrasion? What Can I Expect After a Microdermabrasion Treatment? How Often Should I Do At Home Microdermabrasion? What is your dream skin? Mine is simple: Taut, supple, poreless and smooth like a baby’s. In reality, I have fine lines, sun spots, enlarged pores, some occasional acne spots (from a couple of pimples I get around my period), a couple of deep scars from chicken pox, dull looking and flaky skin during winter, like whoa, that’s quite far from my dream! I’m sure a lot of you girls can relate! Well, I hope at least some, so I’m not the only one here. If you feel like no amount of beauty products is cutting it (like I do), let’s get to know this amazing procedure that may just be the key to achieving our dream skin: Microdermabrasion. You might be thinking “But this is an in-office procedure, this might cost bajillions!”, hush that thought. 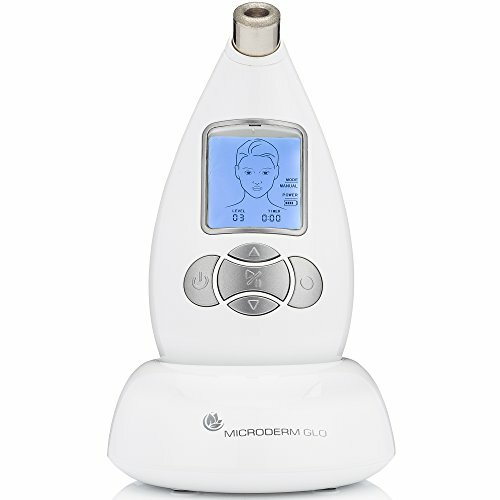 What we will be venturing into today is the best at home microdermabrasion machine. This will save us tons of money and trips to the dermatologist as we move a step closer to our dream skin, a session at a time. First, let’s delve in the specifics of what we’re getting ourselves into. Microdermabrasion is considered as a dermatologically safe and less invasive skin renewal procedure that utilizes a specialized tool with an abrasive surface to slough away dead skin cells revealing a more fresh, even and radiant layer of skin. Perfect for a gentler exfoliation (especially on sensitive areas like your under eyes). It utilizes a diamond tip wand that sloughs away dead skin cells while simultaneously sucking the debris off. You can easily control the depth depending on how much pressure you apply and how long the suction remains on that spot. The best at home microdermabrasion for acne scars usually have this feature. This handpiece sprays fine crystal particles (like aluminum oxide and sodium bicarbonate) to exfoliate dead skin cells. Like the diamond-tip, the wand also suctions the debris almost immediately. This is a newer version of microdermabrasion. As opposed to using crystals to exfoliate, this handpiece combines a simultaneous dermal infusion of products and a totally crystal-free exfoliation. It’s like magic! Improves blood and lymphatic circulation underneath the skin – This means your skin cells get optimum nutrition and oxygen that it needs to give you that healthy glow and improve its elasticity. Improves product efficacy – Dead skin cells and clogged pores may hinder your skin from getting the full effect of your skin care products. Thus, the removal of these impediments may improve the absorption and enhance the moisturizing, acne clearing or anti-aging powers of these products! Minimize pore size, skin texture and overall health – Want to achieve Korean glass skin? As you slough away dead skin cells and resurface a fresher, healthier skin, you can notice a huge improvement on your pore size, texture, and glow. Evens out skin tone – Got nasty marks from pimples or some discoloration due to sun damage? Repeated session of microdermabrasion can surely even out your skin tone. Using the best at home microdermabrasion machine can be as effective as the procedure done in-office but gentler. It’s a preferred method by many especially if they want to achieve tighter pores, remove blackheads, even out skin tone and diminish the appearance of fine lines (diminish – as in reduce, not totally erase it!). However, if you wish to completely remove deep acne scars, wrinkles, and stretch marks, then it’s best to have the procedure done at a clinic where they can do a more thorough (sometimes even rough) procedure using advanced technology. Avoid retinol or other exfoliants 1 to 3 days prior to treatment. Avoid tanning or the use of tanning products a week before the procedure. Ensure you have not gone through laser surgery and have not used Accutane. If you had chemical peels and collagen injections did recently, wait for a few weeks before doing microdermabrasion. Make sure to wash your face with a non-oily and non-soap based cleanser before starting microdermabrasion. As your skin is being exfoliated, you can expect redness, some swelling and tenderness immediately after treatment. These should go away in one to two hours. After treatment, ensure that your face is clean and well moisturized with a gentle moisturizer to keep flaking at bay. Remember to steer clear of your regular exfoliating or anti-acne products until 3-7 days after your treatment. To protect this new skin layer, you must use sunscreen every time you head out as your skin tends to be more sensitive to the sun weeks after your dermabrasion treatment. Depending on what you want to achieve and your skin’s tolerance, you can do microdermabrasion treatments once a week or every 8 weeks. Some people would do 3 weekly treatments successively and then switch to once a month. Ok, but then how many microdermabrasion treatments do you need to see results? Again, it would all depend on your skin and goal. Results are usually noticeable on the first treatment (such as a brighter skin), your skin will definitely improve as you continue your sessions. Since we’ll be doing this on our own, the right tool is important. Safety and quality should always be prioritized over price. You wouldn’t want to worsen your skin’s condition using the wrong product, right? As always, your good ol’ friend (moi!) rounded up the top 3 microdermabrasion machines that I’m considering buying myself (not all 3, just 1 from the list). The best at home diamond microdermabrasion machine out there that is both safe and effective. Microderm GLO has an ergonomic design that is easy to use and convenient to bring anywhere! Best of all it only takes 4 minutes of treatment to get that radiant, poreless skin. Professional results right in the comfort of your own home! Diamond safe 3D suction technology. Suction level is too safe it may come off as weak. The handheld device may feel bulky for people with small hands. Trophy Skin by RejuvadermMD picked up what Microderm GLO lacks. This device is way slicker and easier to hold than the previous product and can be used on any part of the body. For only 5 minutes per treatment, you can say hello to visibly smoother skin and finer pores. 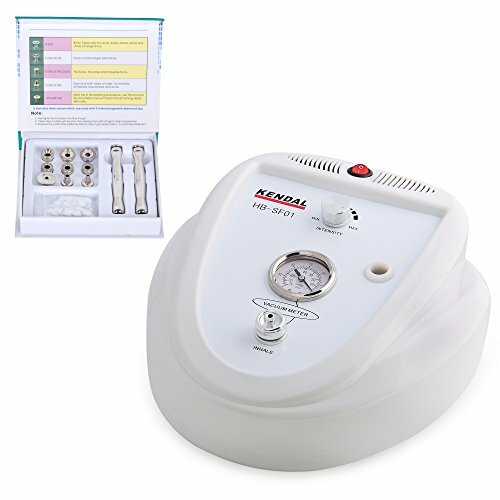 I think it’s definitely one of the best-rated home dermabrasion machines out there! Looks like a really promising product, however, I couldn’t find any mention whether the product is FDA approved or not. Are you a salon expert who’s looking for the best professional microdermabrasion machine that you can use both for your business and at home? Look no further, Kendal is here! This kit comes complete with two stainless steel handles, 9 interchangeable diamond tip heads, and 360 pieces of cotton filter – great value for your money! Used with a cord attached. Has lots of different parts that may easily get misplaced. Q: Can microdermabrasion get rid of blackheads and clogged pores? A: Microdermabrasion effectively rids the skin of surface gunk including dead skin cells which can clog our dear pores and cause whiteheads, blackheads, and acne. Q: Does microdermabrasion remove hair? A: No. Microdermabrasion only works on the top level of your skin and not on the deeper levels at which hair grow. If you’re interested in facial hair removal or just generally hair removal, click here to read more on the matter. Q: How long after microdermabrasion can I wax? A: As dermabrasion can cause your skin to be really sensitive, you should wait at least a week or two before waxing to give your skin enough time to heal itself. Q: Should I shave before microdermabrasion? A: It’s not that much of a requirement for women as it is for men. But if needed, you can shave a few hours before doing microdermabrasion. Q: Can you do laser hair removal after microdermabrasion? A: You may want to skip laser hair removal right after a dermabrasion treatment. You may only do so 3-4 weeks after treatment. Q: Is microdermabrasion good for wrinkles? A: It is. However, if you’re looking for a total elimination of wrinkles, it’s best to have it done by a professional as at home microdermabrasion can only improve the appearance of wrinkles and fine lines (just to set your expectations) but not completely remove it. Q: Does microdermabrasion help under eye wrinkles? A: Under eye is a really sensitive area to be exfoliated and suctioned vigorously. I would personally suggest avoiding this area when doing microdermabrasion. Consult your dermatologist for the best solution for under eye wrinkles. Q: Is microdermabrasion good for dark skin? A: No. Microdermabrasion, when used on dark skin, may cause severe scarring and discoloration. Consult your doctor to see if there’s a safer treatment available. Q: How long after microdermabrasion can I tan? A: Wait until 3-4 weeks after treatment. Again, it’s all about letting your skin rest and recover. Q: Can you put makeup on after microdermabrasion? A: No. Dermatologists suggest keeping your face clean at all cost after treatment and makeup does the complete opposite of that. I know the visible redness and bruises is not the perfect look for you, but neither is negative skin reaction and uber visible flaking. Microdermabrasion may be an expensive choice for achieving the perfect skin. Thanks to the best at home microdermabrasion machine, nearly everyone can do it right in the comfort of their own home sans a hefty fee for several sessions. lastly, know what to expect. As with any exfoliating treatments, may it be chemical or regular bath products (like body scrubs, loofah, etc. ), expect redness. Microdermabrasion is not only sloughing off dead skin cells from that area but it’s also bringing more blood flow on that spot. This will all go away a few hours after treatment so do not worry! Have you experienced dermabrasion at home or in the clinic? What was it like? Did you get positive results out of it? Share your experiences and thoughts about this treatment by commenting down below.